The College has established an articulation agreement with the following Mainland and overseas universities for our graduates to articulate to the following degree programmes. The programme offers a minimum 400-hour summer internship at airport ground service or travel agencies. A career talk by Hong Kong Aviation Ground Services Limited was arranged for Year 2 students of Higher Diploma in Airline Service and Management on 5 May 2017 to prepare them with up-to-date knowledge and exposures required for career development in the Airline Ground Services Industry. With the sharing from the professionals in the industry, students could better grasp the interview skills and real-life working environment, so as to put theory into practice. At this career talk, students can apply the position of Customer Service Officer. 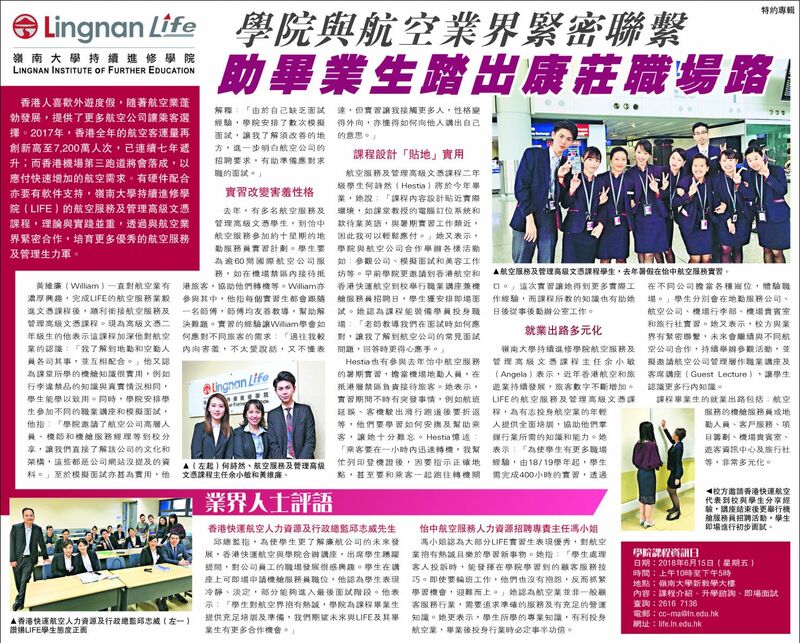 A career talk by Hong Kong Airlines Limited was arranged for Year 2 students of Higher Diploma in Airline Service and Management on 20 April 2017 to expose them to up-to-date knowledge of Aviation industry specially in Inflight Service. 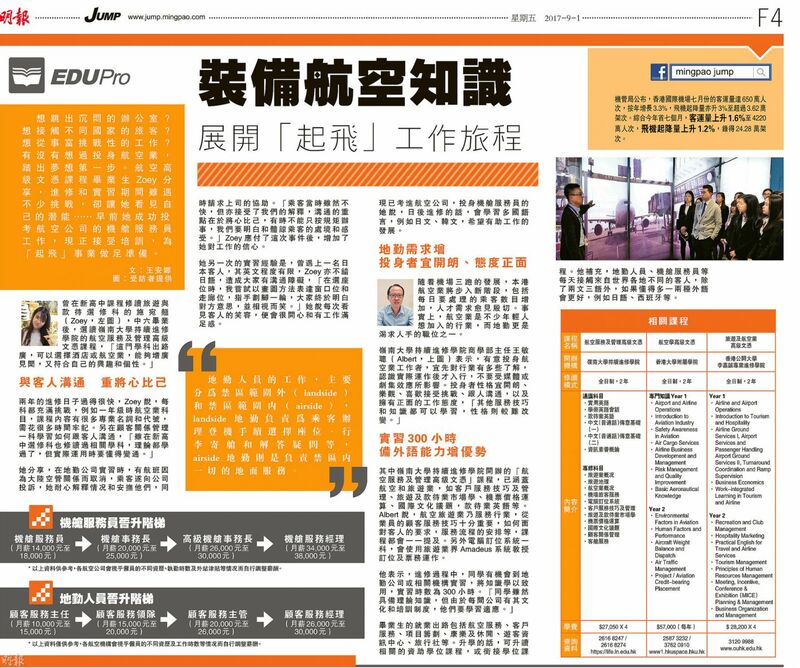 With the recruiting and flying experience sharing from Ms. Emily Lee, Cabin Crew Recruitment - Service Delivery Department, students could better grasp the interview skills and working environment in airlines. As a former Cabin Crew at Hong Kong Airlines Limited, Emily also shared the skills of handling the Cabin Crew Interview during this Career Talk. This was an opportunity to promote the integration of theory into practice. Besides, experienced Cabin Crew Mr. Newton Chan has shared his own inflight service experience at Hong Kong Airlines Limited in these years as well. At this career talk, students can apply the cabin crew positions of Hong Kong Airlines. Most students have been recruited after their interviews. A visit to Civil Aviation Department Education Path was arranged for Year 1 students of Higher Diploma in Airline Service and Management.